“Together, we can contribute to a peaceful and prosperous Bangladesh. 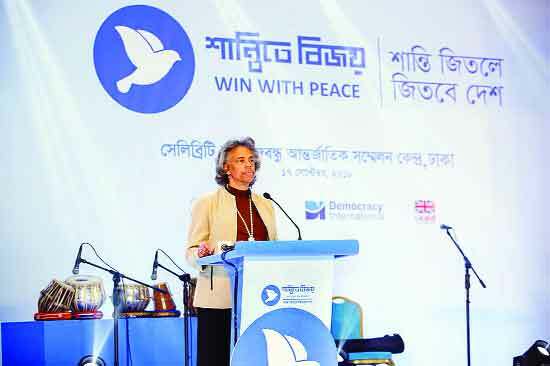 A free, fair and inclusive election is important for a democracy, especially for the one which is on track to become a middle-income country.” said US Ambassador to Bangladesh Marcia Bernicat, while addressing the inaugural ceremony of a campaign launched at the Celebrity Hall of Bangabandhu International Convention Centre (BICC) on septembe 17, 2018. More than 400 leaders of the Awami League and the BNP converged on one platform at the initiate of development partners to pledge nonviolent and peaceful general elections. The political leaders from 40 districts attended the launch of the Shantite Bijoy (Win with Peace) campaign of Democracy. Prime Minister’s Political Advisor HT Imam and BNP Standing Committee member Moyeen Khan, US Ambassador Marcia Bernicat, and British High Commissioner Alison Blake, among others, spoke at the event. The elections of Bangladesh invariably attract the diplomatic attention of the international community. Because here the political landscape is extraordinarily toxic. Whenever they’re out of power, parties lose all faith that the sitting government can or will convene a fair election. The Election Commission is independent on paper, but not in practice, and ever since the 1990-91 transition from military to parliamentary rule in Bangladesh, every general election has taken place in a climate of ominous uncertainty. The pattern is clear: whichever party is in power tries to manipulate the electoral architecture and exploit a politicised public sector, while the opposition demand that a non-partisan caretaker government should be installed to provide a level playing field. And each time, the situation turns lethal. So the pressure for a fair election is applied mainly by Western diplomatic missions, the European Union, the United Nations and so on. Various high-level envoys and teams have visited Bangladesh over the years to help build consensus among the political parties and set up some kind of interim government to arrange a free and fair election. The tenure of Bangladesh’s current parliament, more than half of whose members were elected uncontested in a violent and disputed election in 2014, has come to an end. Barring exceptional circumstances, the Constitution of Bangladesh requires that the elections take place within the 90-day period before the expiration of the term of the Jatiya Sangsad. The current Sangshad first sat on 29 January 2014, so in accordance with article 123(2)(a) of the Constitution, the next election is expected be held on a date between November 2018 and January 2019. With a general election on the horizon, various diplomatic missions are stepping up their efforts to help things run as smoothly as possible. The Win with Peace campaign was launched under Strengthening Political Landscape (SPL) project implemented by Democracy International and co-funded by the US Agency for International Development (USAID) and the United Kingdom’s Department for International Development (UK Aid). With the general elections approaching, the Win with Peace campaign will engage and raise awareness among registered political parties, candidates, and citizens in Bangladesh on the importance of peaceful elections and tolerant politics, Democracy International said. The campaign is providing the people of Bangladesh with a platform to raise their voice to demand peace, harmony, and tolerant politics. It is bringing together political leaders and citizens of Bangladesh in peace rallies, face-to-face dialogues with candidates, round table meetings, and workshops across Bangladesh. “The government is always sincere about establishing a democratic, peaceful, and ideal Bangladesh. For peaceful elections in the future everybody should refrain from false propaganda, and cease spreading hatred,” HT Imam said on the campaign. 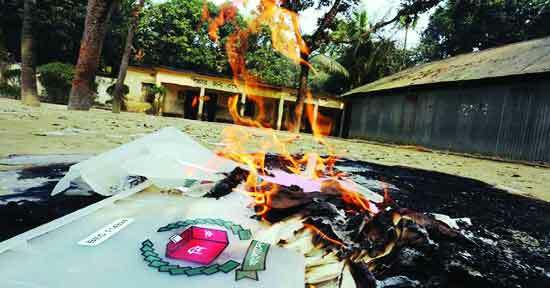 But in fact, the electoral system of Bangladesh has been largely damaged by the ruling party Awamy League. The local elections under this government have been the example of so controlled and much rigged. During electioneering, the law enforcement agencies launched a drive to arrest opposition men who were facing cases for various alleged offences. To arrest the accused opposition men, the law enforcers raided their residences. The drives however generated panic among the men of the opposition. On October 7, AL presidium member and 14-party alliance spokesperson Mohammad Nasim said that there would be serious repercussion within the BNP to any decision to boycott the next parliamentary elections. In the ahead of election, numerous ‘false’ cases have been filed against the BNP leaders and workers all over the country. The police implicated as many as 55 BNP leaders including the party secretary general Mirza Fakhrul Islam Alamgir, Moudud Ahmed, Mirza Abbas, Goyeshwar Chandra Roy, Abdul Moyeen Khan and Nazrul Islam Khan, senior joint secretary general Ruhul Kabir Rizvi and joint secretary general Amanullah Aman. In the meantime, The new platform consists of eminent jurist Dr Kamal Hossain led Gono Forum, former president Dr AQM Badruddoza Chowdhury led Bikalpa Dhara Bangladesh, ASM Rob led Jatiya Samajtantrik Dal, Kader Siddique led Krishak Sramik Janata League, and Mahmudur Rahman Manna led Nagorik Oikya. The ruling Awami League welcomed the alliance, But after the citizens’ rally, which was convened by Dr Kamal and joined by senior BNP leaders including Secretary General Mirza Fakhrul, ruling party leaders now smell a rat. The rally issued an ultimatum to the government for implementing its three-point demands including the formation of a polls-time neutral administration by Sept 30. The two other demands are the reconstitution of the current Election Commission and dissolution of the 10th parliament before the election. Calls for release of jailed BNP chief and former prime minister Khaleda Zia also came from the rally and that’s where Awami League leaders said triggers the suspicion of a ‘conspiracy’. “Dr Kamal Hossain has never practised politics in good faith, which is once again clear from the BNP appearing at his rally and calls for Khaleda’s release,” said Joint General Secretary Abdur Rahman. According to a report of Daily Prothom Alo, Ruling Awami League has made a three-pronged strategy to keep the opposition under constant pressure before the 11th parliamentary elections, the party insiders say. Such strategy includes continued contorl over the streets by holding the ruling party and its alliance’s programmes until the announcement of polls schedule, making top leaders of the BNP, the National Unity Process and Jukta (United) Front ‘controversial’ and stopping the opposition from taking to the streets. However, everyone concerned clearly remembers the turbulence of the 2014 election, when all sorts of political violence boiled over, claiming many innocent lives. But the explanation for why it happened is still a matter of heated debate. The American, British and Indian ambassadors have all visited the Election Commission in recent months, as has the UN resident co-ordinator for Bangladesh. They have publicly expressed their concerns for the forthcoming election, and implored the commission to take measures to avoid the boycotts and violence that marred the election process last time around. Some in Bangladesh welcome these entreaties, but others in the ruling alliance consider them nothing more than attempts to meddle in their country’s affairs. Apart from the Western countries, India has been particularly influential ever since it supported Bangladesh in the 1971 war of independence. After the disputed 2014 election, it endorsed the Awami League’s victory even though many Western governments and outside organisations expressed their reservations; through its influence on South Asian geopolitics and diplomacy, India ultimately managed to sway the international community to acknowledge the result. The issue of influence of India in our political affairs gets importance as India is not only the most powerful country in the South-Asia but also the biggest neighbour of Bangladesh. Moreover, India has a special interest in Bangladesh as the country is not only a huge market for the Indian goods, but also an important geographical location that has immense significance concerning the issue of Indian security. Thus, Indian foreign policy always expects the existence of such a government in Bangladesh that would work together with them. Thus, from the perspective of India, exerting influence on the political process of Bangladesh is a strategic aspect of their foreign policy. 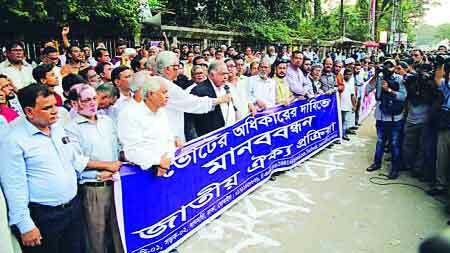 Indian high commissioners have backed the Awami League to the tilt while posted to Dhaka. That did not matter with the Awami League in power as is the situation at present. However, they have also backed the Awami League’s interests even when some other party has been in power. Their bias has been part of an undefined but clearly obvious Indian policy of putting all its eggs in the Awami League’s basket in dealing with Bangladesh. The article has come out at a time when the Awami League needs New Delhi’s support more than leading to the 2014 elections. The writer has quoted critics of the Awami League and stated what the media in Bangladesh dare not print, like for instance that ‘every national institution has been compromised and packed with party sympathizers’, about forcing Justice SK Sinha into exile, the grabbing of Hindu property by AL supporters, et cetera. The only consolation he made for AL supporters has been the fact that he gave them hope that their party would return to power but that too by ‘managing’ or ‘rigging’ the elections. Now, New Delhi’s backing for the ruling party under the present political situation that it could do only by force or some other devious means would only make it more unacceptable in Bangladesh. How long a legitimate government? The journey towards democracy is not a novel phenomenon in Bangladesh. The people of Bangladesh struggled for democratic political system for long years. The process of democratization that started in Bangladesh following the liberation was not very encouraging. It has proceeded in the midst of ups and downs. The role of the government and the opposition was not conducive to democratizing the political system through free and fair elections and institutionalization during the recent past. Historically, we can say that the institutionalisation of democracy and free and fair elections, which is required for democratic functions and stability, has been hampered in Bangladesh mainly by the ruling party contributing to the continuation of the movement for Non-Party Caretaker Government by the opposition political parties. The international community should do everything it can to improve ordinary Bangladeshis’ lives, or at least avoid further unnecessary deaths – especially when a general election is approaching fast. It is the internal political dynamics and behavior of main political actors that invite external players to play a role in Bangladesh’s internal affairs. The ‘zero-sum’ political culture always creates a room for external forces to exploit the opportunity. Democratic consolidation is the best answer to keep away the outside actors to intervene in our political process. The political will to sustain democracy within and beyond party has to be strong, and democratic norms and procedures need to be followed.